A short and extremely durable suppressor. The HX-QD 556k is built with proven Flow-Through™ technology, delivers sub-140 dB performance, is full-auto rated and easily passes the USSOCOM Reliability Stress Test – it’s designed and built for abuse. Materials & Finish: Unlike traditional suppressors that manage trapped gas, intense heat and pressure with blast baffles, OSS’s Flow-Through technology redirects expanding gases forward allowing us to use 17-4 stainless steel deflectors and internal Grade 5 Titanium coils. The result is a remarkably cooler and extremely durable suppressor. The HX-QD 556k has a fully-welded outer body made of 17-4 heat treated stainless steel coated with C-series high temperature black Cerakote®. ⚠︎ California Proposition 65 WARNING: Click Here. An extremely rugged suppressor, the HX-QD 556 is built with proven Flow-Through™ technology, delivers hearing safe mid-130s dB performance, has no barrel length restrictions, is full-auto rated, and easily passes the USSOCOM Reliability Stress Test – it’s the ideal suppressor for all 5.56 rifles. Materials & Finish: Unlike traditional suppressors that manage trapped gas, intense heat and pressure with blast baffles, OSS’s Flow-Through technology redirects expanding gases forward allowing us to use 17-4 stainless steel deflectors and internal Grade 5 Titanium coils. The result is a remarkably cooler and extremely durable suppressor. The HX-QD 556 has a fully-welded outer body made of 17-4 heat treated stainless steel coated with C-series high temperature black Cerakote®. A strong “utility player” suppressor built with proven Flow-Through™ technology. The HX-QD 762’s design and development were heavily influenced by the U.S. Army CSASS requirements, it delivers 136-139 dB performance, is full-auto rated up to 5.56, and is cross-platform compatible up to .300 WM — there’s no other suppressor like it on the market. OSS Flow-Through suppressors redirect expanding gases forward using a 17-4 stainless steel deflectors and internal Grade 5 Titanium coils. 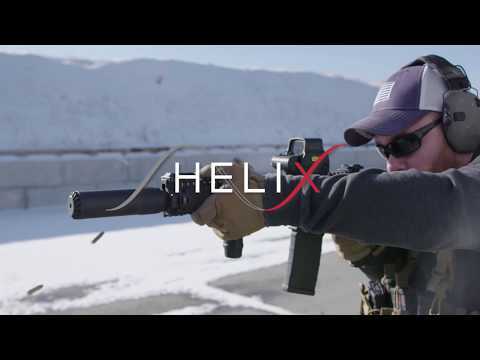 The result is a comparatively cooler and extremely durable suppressor – temperature testing confirms, the HX-QD 762 runs about half as hot as a baffle can at each stage of the CSASS endurance test. The fully-welded outer body is made of 17-4 heat treated stainless steel coated with C-series high temperature black Cerakote®. The HX-QD 762 is the optimal choice for the widest range of rifles of different calibers. Sound pressure levels are measured at the shooters ear to comply with current military specifications. A lightweight and durable multi-caliber suppressor with proven Flow-Through™ technology, the HX-QD 762 Ti is built with a combination of Grade 5 Titanium and heat treated 17-4 stainless steel. It delivers superior accuracy and repeatability, hearing safe 136-139 dB performance, is full-auto rated on 5.56, and cross-platform compatible on 5.56 up to .300 WM– the one to have when every ounce counts. Materials & Finish: Unlike traditional suppressors that manage trapped gas, intense heat and pressure with blast baffles, OSS’s Flow-Through technology redirects expanding gases forward allowing us to use 17-4 stainless steel deflectors and internal Grade 5 Titanium coils. The result is a remarkably cooler and extremely durable suppressor. The HX-QD 762 has a fully-welded outer body made of Grade 5 Titanium coated with C-series high temperature gray Cerakote®. Sound Pressure Levels: The HX-QD 762 Ti is a light-weight optimal choice for the widest range of rifles of different calibers. Sound pressure levels are measured at the shooters ear to comply with current military specifications. A short, lightweight and durable Flow-Through suppressor for large bore rifles, the HX-QD Magnum Ti is built with Grade 5 titanium and heat treated 17-4 stainless steel. Perfect for precision shooters, it delivers hearing safe suppression from 5.56 (sub-133 dB) to .338 (sub-139 dB), is full-auto rated on 5.56, and cross-platform compatible on 5.56 up to .338 Lapua— no other .338 suppressor is this versatile. Materials & Finish: Unlike traditional suppressors that manage trapped gas, intense heat and pressure with blast baffles, OSS’s Flow-Through technology redirects expanding gases forward allowing us to use 17-4 stainless steel deflectors and internal Grade 5 Titanium coils. The result is a remarkably cooler and extremely durable suppressor. The HX-QD Magnum Ti has a fully-welded outer body made of Grade 5 Titanium coated with C-series high temperature gray Cerakote®. Sound Pressure Levels: The HX-QD Magnum Ti is a light-weight optimal choice for the widest range of rifles of different calibers. Sound pressure levels are measured at the shooters ear to comply with current military specifications. The new HX-QD 762 MG suppressor was designed and developed – utilizing Flow-Through™ technology – to meet emerging military requirements for belt-fed machine guns. In collaboration with military and OEM partners, the HX-QD 762 MG was specifically engineered to effectively reduce full-auto sound and flash signature without negatively affecting weapon reliability. In addition, battlefield communications are dramatically improved.